In our Louisville Preview, we said to watch for several things. First of all, Louisville is doing an outstanding job at Defensive Efficiency, especially on limiting 2-point field goals. Second, Louisville is limiting almost all opponents to under 35% Offensive Rebounding Percentage. Finally, Louisville likes to keep the pace down. Hey, new season lows! It's no secret that Marquette shot horribly, but here is how horribly they shot. Marquette's previous low at Offensive Efficiency was 89.0 (against Seton Hall), and before that they'd never been below 100. Marquette's previous season low at effective Field Goal Percentage (eFG%) was 40.2%, and our season average is 53%. We are one of the best teams in the nation at both of these areas, but not last night. Marquette also achieved a season low at defensive Free Throw Rate. The 59% number for Louisville means that about 60% of the time that Louisville attempted a shot, they also shot a free throw. 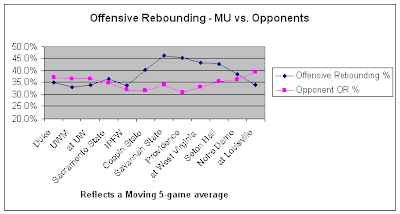 Looking at the graph above, we can see the moving 5-game average for Marquette's Offensive Rebounding % (blue) and our opponents' OR% (pink). That sloping downward trend started once Big EAST play began. Remember too that Marquette was once as high as #7 in the Nation at Offensive Rebounding, but we're now at 28 and falling. Plus, our opponents are doing better and better against us. Not to point to doom and gloom, but two of our team strengths this year have been effective Field Goal Percentage (eFG%) and Offensive Rebounding Percentage (OR%). Once the Big EAST started, both of those areas have gradually gotten worse. These two trends need to reverse themselves to allow MU to have success this season. If you are looking for a silver lining on an individual basis, it's that Wesley Matthews and Lawrence Blackledge had a net positive game. After that, the whole team pretty much did poorly. James and Hayward had their worst games of the season (statistically), but expect that to rebound. Hopefully, James will be able to play on Sunday. There have been increasing calls to play Blackledge more. He certainly brings an energy to the game, and performed admirably against Harangody. Blackledge's blocks and dunks are a spark, but does he deserve more time? First, some perspective on the graph above. It's a cumulative view of each player's contribution on a per-game basis. Upward trends are good and downward trends are bad. One is looking to see a trend that is overall positive or overall negative. 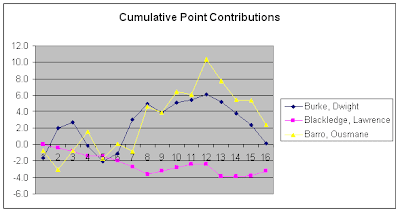 Looking at the trends of the cumulative point contributions for our Three B's, we can see a few things. Both Burke and Barro are in a serious slump. Ever since the West Virginia game, their net contributions have declined consistently every game. This isn't really news. Blackledge isn't exactly tearing things up from a contribution perspective, because he's basically flat. The difference is that his net contribution isn't negative like Burke and Barro. It's kind of like being "queen of the pigs". Therefore, the Cracked Sidewalks view is that Blackledge deserves more time... sort of. The team needs Barro and Burke to break out of their slump soon. We are going to need them for the rest of the season. Let's move on and get ready for UConn. Originally I was not looking forward to the Sugar report for this game, but cudos to new creativity. The "advantage" indicator in graphic 1 keeps me from getting a headache and trending the analysis provides new perspective (particularly in the Trend trend analysis). I agree with the 'sort of' oppinion on Trend, but TC should give him a start. If nothing else it may light a fire under the other 2 (although the fire is still out under Ooze afer losing his starting job). Burke has been terrible. He has no offensive moves other than to dunk. Barro is reliant on a running game and penetrating guards. We haven't seen enough of Blackledge posting up as he often roams the three-point line and drives in for a shot or rebound. But...Blackledge deserves more PT. A start would be nice too, but it depends on who they are playing. It's all about the match-ups. Next year we'll hopefully have a bigger and healthy Mbakwe and hopefully the same goes for Hazel. Burke really, really needs to improve, but at this point, he is what he is. According to this numerical "creativity" Fitz is not that much of a liability. In my opinion the figures don't tell the true story about Fitz. He contributes nothing on offense and very little on defense and there is no improvement. To anonymous #2 - the numbers actually show that Fitz provided almost nothing in the game against Louisville. In 12 minutes of play, he had only one possession and contributed only 2.5 points, of which his net impact was negative. Remember too that doing nothing is different than doing something overtly negative. Missing a shot and committing a turnover are explicitly negative. Fitz' impact is basically that he didn't really contribute against Louisville. However, I'm not going to rag on him, because he can be an extremely efficient offensive player when he shoots! Call it ragging if you want. I call it lack of senior leadership! Absolutely Pathetic. These guys are not ready to play. Totally inexcusable. UCONN is an average team. 8-29 in the first half and UCONN is shooting 56%. 19 pts at L'ville 1st half and 24 today what a joke. Did anyone show up that half other than Hayward? Have some fkin pride. This game is critical and was basically over within the first 7 mins. Way to prepare your team Mr. Crean. 1.3 mill a season, no tourney wins w/out Wade, no inside recruits, no game adjustments, no strategy as far as I can tell other than let perimters players drive and see what happens. When MU misses jumpers they are an NIT team period end of discussion. Team has enough talent to compete with anyone and Crean is not getting the most out of his players. I'm sure he'll get another extention though.